Mozilla Thunderbird is a free email client and RSS feed reader, developed by Mozilla Foundation. It makes your e-mailing, faster and easier with intelligent spam filters, a built-in spell checker, extension support, and more. Furthermore, Thunderbird designed to help you stay safe by preventing viruses and stopping junk mail using leading-edge phishing and spam filters. Thunderbird supports POP and IMAP. It also supports LDAP address completion. The built-in RSS/Atom reader can also be used as a simple news aggregator. Thunderbird supports the S/MIME standard, extensions such as Enigmail add support for the OpenPGP standard. The program can also manage multiple email, newsgroup, and news feed accounts and supports multiple identities within accounts. Features such as quick search, saved search folders ("virtual folders"), advanced message filtering, message grouping, and labels help manage and find messages. On Linux-based systems, system mail (movemail) accounts are supported. Thunderbird provides basic support for system-specific new email notifications and can be extended with advanced notification support using an add-on. 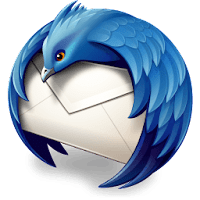 Mozilla Thunderbird is a cross-platform app available for Windows, Mac, and Linux. Disclaimer: Direct downloads for the lastest version of Mozilla Thunderbird 52.3.0 are provided by the official software's author, we can't guarantee safety, availability or download speed. Moreover, we don't and we won't provide any pirated/illegal versions or tools. We recommend you to avoid it as these methods can harm your device. If you like the software, buy it to support the developers. (We provide software discounts for many worldwide brands).